My girlfriend and I balance each other out perfectly in the outdoors. She’s a climber and I’m a waterman. She knows how much food to pack, down to the calorie, and I (almost) never get us lost. She has all this camera gear, and I never get cold so there’s always room in my pack where warm layers should be. But we have radically different ideas when it comes to shelter. I have one criterion: if it keeps the rain off, I’m good. > Keep the rain off. > Keep mosquitos and midges out. > Act as a barrier against things that crawl and slither. > Keep out murderers and tent burglers. Guess who wins that argument? When we camp together, we usually sleep in a tent. But I have learned (the hard way) that it pays to bring a tarp even when you’re sleeping in a tent. 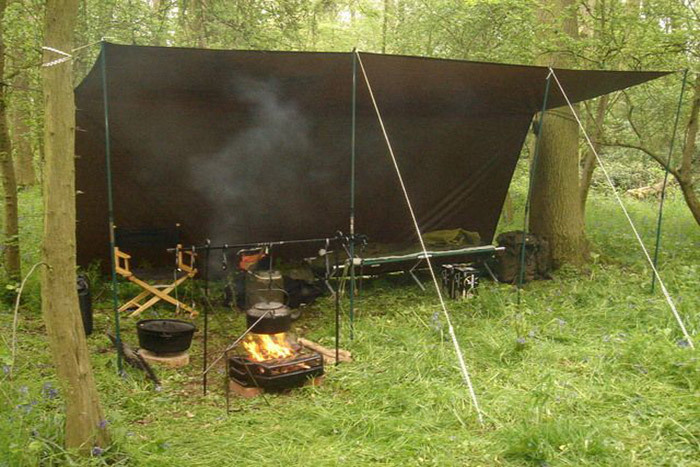 Here are few things you can do with your tarp other than sleep under it. Let’s start with the Macgyver option. Maybe you’re taking a shortcut across a lake, maybe you’re bored in camp on a rest day and need a project, or maybe you actually need a raft for survival purposes. With just a few branches and some paracord, you can turn your 3×3 tarp into a raft. You can make an oar with the tarp bag and the right shaped stick.